Ferdinand Magellan (Portuguese: Fernão de Magalhães, IPA pronunciation: /fɨɾ'nɐ̃ũ dɨ mɐɣɐ'ʎɐ̃ĩʃ/; Spanish: Fernando or Hernando de Magallanes;' Spring 1480 – April 27, 1521) was a Portuguese maritime explorer who, at the service of Spain, led the first successful attempt at world circumnavigation. He did not complete his final, westward voyage, but was killed during the Battle of Mactan in the Philippines. Of the 237 crew members who set out with Magellan in August 1519, only 18 managed to return to Spain and thereby complete the circumnavigation in September 1522. Magellan was the first to reach Asia by sailing westward from Europe, the objective of the voyage of Christopher Columbus in 1492, which led to the discovery of the American continents. Magellan was also the first navigator to cross the vast Pacific Ocean, nearly four times the expanse of the Atlantic and first discovered by the Spanish explorer Vasco Núñez de Balboa less than 10 years previously. The voyage of 14,460 leagues (69,800 kilometers or 43,400 miles) provided conclusive evidence of the true circumference of the earth. Magellan's successful expedition during the Age of Discovery opened up of the whole globe to European exploration and colonization. During the centuries that followed, European colonizers would remold the world, spreading Christianity while often abusing indigenous peoples and exploiting colonial populations. Yet Magellan's discovery helped establish the notion that all the peoples of the earth share one globe and a common humanity. Ferdinand Magellan was born in Villa Real or Oporto, Portugal in 1480, of noble parentage. Magellan's parents died when he was only 10, and he was reared as a page in the royal household. 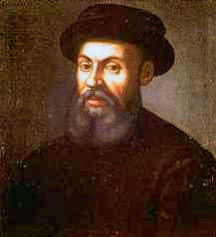 Magellan went on his first voyage on the sea at the age of 25, in 1505, when he was sent to India to install Francisco de Almeida as the Portuguese viceroy. The voyage gave Magellan his first experience of battle when a local king, who had paid tribute to Vasco da Gama three years earlier, refused to pay tribute to Almeida. Almeida's party attacked and conquered the capital of Kilwa in present-day Tanzania. In 1506, Magellan traveled to the East Indies and joined expeditions to Spice Islands (Malacca Island). In February 1509, he took part in the naval Battle of Diu, which marked the decline of Ottoman influence in the area. In 1510, he was made a captain. Within a year, however, he had lost his commission after sailing a ship eastward without permission. He was forced to return to Portugal in 1512. In 1513, Magellan was sent to Morocco, where he fought in the Battle of Azamor. In the midst of the battle, he received a severe knee wound. After taking leave without permission, he fell out of favor with Almeida, and was also accused of trading illegally with the Moors. Several of the accusations were subsequently dropped, but Magellan fell into disfavor at the court of the new king, Manuel I. He refused to increase Magellan's pension and told him that there would be no further offers of employment after May 15, 1514. Magellan therefore decided to offer his services to the court of Spain. The aim of Columbus' voyage to the West was to reach the coasts of the Spice Islands and to establish commercial relations between Spain and the several Asian Kingdoms. The voyage was also sent to establish contact with the legendary kingdom of Prestor John. But the Spanish soon realized after Columbus' voyages that the lands of America were not a part of Asia, but a new continent. Once Vasco da Gama and the Portuguese arrived at India in 1498, it became urgent for Spain to find a new commercial route to Asia. The Treaty of Tordesillas reserved for Portugal the routes that went around Africa. So the Spanish Crown decided to send out exploration voyages in order to find a way to Asia by traveling westwards. Vasco Núñez de Balboa discovered the Pacific Ocean in 1513, and Juan Díaz de Solís died in Río de la Plata some years later trying to find a passage in South America. When Magellan arrived at the Court of Spain, he presented King Charles V with a plan which would bring the ships of the Crown of Castile a full access to the lands of the Spice Islands. On August 10, 1519, five ships (Trinidad, San Antonio, Concepcion, Victoria, and Santiago) under Magellan's command left Seville and traveled from the Guadalquivir River to Sanlúcar de Barrameda at the mouth of the rivers, where they remained more than five weeks. Spanish authorities were wary of the Portuguese admiral and almost prevented Magellan from sailing, and switched his crew of mostly Portuguese men with men of Spain, but on September 20, Magellan set sail from Sanlúcar de Barrameda with about 270 men. King Manuel ordered a naval detachment to pursue Magellan, but the commander avoided the Portuguese. After stopping at the Canary Islands, Magellan arrived at the Cape Verde Islands, where he set course for Cape St. Augustine in Brazil. On November 27, the fleet crossed the equator; on December 6, the crew sighted Brazil. Since Brazil was Portuguese territory, Magellan was cautious, and on December 13, anchored near present-day Rio de Janeiro. There the crew was resupplied, but bad conditions caused them to delay. Afterwards, they continued to sail south along South America's east coast, looking for the strait that Magellan believed would lead to the Spice Islands. The fleet reached Río de la Plata on January 10, 1520. On March 30, the crew established a settlement that they called Puerto San Julian. A mutiny involving two of the five ship captains broke out. It was unsuccessful because the crew remained loyal, and Antonio Pigafetta relates that Gaspar Quesada, the captain of Concepcion, was executed, while other mutineers were instead marooned on the coast. The journey resumed. Santiago, sent down the coast on a scouting expedition, was wrecked in a sudden storm, although all of its crew members survived and made it safely to shore. Two of them returned, overland, to inform Magellan of what had happened, and bring rescue to their comrades. After this experience, Magellan decided to wait for a few weeks more before again resuming the voyage. At 52°S latitude on August 24, 1520, the fleet reached Cape Virgenes and concluded they had found the passage, because the inland waters were brine and deep. Four ships began an arduous passage through the 373 mile long passage that Magellan called the Estreito (Canal) de Todos los Santos ("All Saints' Channel"), because the fleet traveled through it on November 1—All Saints' Day. The strait is now named the Strait of Magellan. Magellan first assigned Concepcion and San Antonio to explore the strait, but the latter, commanded by Gomez, deserted and returned to Spain on November 20, 1520. On November 28, the three remaining ships entered the South Pacific. Magellan named the waters the Mar Pacifico (Pacific Ocean) because of its apparent stillness after navigating the turbulent straits. Heading northwest, the crew reached the equator on February 13, 1521. On March 6, they reached the Marianas and Guam. Magellan called the island of Guam the "Island of Sails" because they saw a lot of sailboats. They renamed it to "Ladrones Island" because a lot of small boats of Trinidad were stolen here. On March 16, Magellan reached the island of Homonhon in the Philippines, with 150 crewmen left. Magellan was able to communicate with the native peoples because his Malay interpreter could understand their language. They traded gifts with Rajah Kolambu of Limasawa, who guided them to Cebu, on April 7. Rajah Humabon of Cebu was friendly to them, and even agreed to accept Christianity. When morning came, forty-nine of us leaped into the water up to our thighs, and walked through water for more than two cross-bow flights before we could reach the shore. The boats could not approach nearer because of certain rocks in the water. The other eleven men remained behind to guard the boats. When we reached land, [the natives] had formed in three divisions to the number of more than one thousand five hundred persons. When they saw us, they charged down upon us with exceeding loud cries… The musketeers and crossbow-men shot from a distance for about a half-hour, but uselessly… Recognizing the captain, so many turned upon him that they knocked his helmet off his head twice… A native hurled a bamboo spear into the captain's face, but the latter immediately killed him with his lance, which he left in the native's body. Then, trying to lay hand on sword, he could draw it out but halfway, because he had been wounded in the arm with a bamboo spear. When the natives saw that, they all hurled themselves upon him. One of them wounded him on the left leg with a large cutlass, which resembles a scimitar, only being larger. That caused the captain to fall face downward, when immediately they rushed upon him with iron and bamboo spears and with their cutlasses, until they killed our mirror, our light, our comfort, and our true guide. When they wounded him, he turned back many times to see whether we were all in the boats. Thereupon, beholding him dead, we, wounded, retreated, as best we could, to the boats, which were already pulling off. Magellan had provided in his will that his Malay interpreter was to be freed upon Magellan's death. His interpreter, who was baptized as Enrique (Henry the Black) in Malacca in 1511, had been captured by Sumatran slavers from his home islands. Enrique was indentured by Magellan during his earlier voyages to Malacca, and was at his side during the battles in Africa, during Magellan's disgrace at the King's court in Portugal, and during Magellan's successful raising of a fleet. Thus, Enrique became the first man to circumnavigate the globe (in multiple voyages). However, after Mactan, the remaining ship's masters refused to free Enrique. Enrique escaped his indenture on May 1, with the aid of Rajah Humabon of Cebu, amid the deaths of almost 30 crewmen. However, Antonio Pigafetta had been making notes about the language, and was apparently able to continue communications during the rest of the voyage. The casualties suffered in the Philippines left the expedition with too few men to sail the three remaining ships. Accordingly, on May 2, 1521, they abandoned Concepción, burning the ship to make sure it could not be used against them. 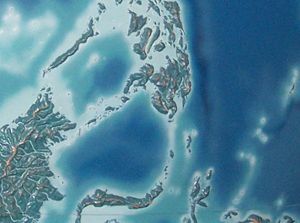 The fleet, now reduced to Trinidad and Victoria, fled westward to Palawan. They left that island on June 21, 1521, and were guided to Brunei, Borneo, by Moro pilots, who could navigate the shallow seas. They anchored off the Brunei breakwater for 35 days, where the Venetian Pigafetta mentions the splendor of Rajah Siripada's court (gold, two pearls the size of hens' eggs, etc.). In addition, Brunei boasted tame elephants and armament of 62 cannons, more than 5 times the armament of Magellan's ships. Brunei disdained the cloves, which were to prove more valuable than gold, upon the return to Spain. Pigafetta mentions some of the technology of the court, such as porcelain (which was not yet widely available in Europe) and spectacles (eyeglasses were only just becoming available in Europe). The two remaining ships, laden with valuable spices, attempted to return to Spain by sailing west. As they left the Moluccas, however, Trinidad was found to be taking on water. The crew tried to discover and repair the leak, but failed. They concluded that Trinidad would need to spend considerable time being overhauled. The small Victoria was not large enough to accommodate all the surviving crew members. As a result, Victoria, with some of the crew, sailed west for Spain. Several weeks later, Trinidad left the Moluccas to attempt to return to Spain via the Pacific route. This attempt failed; the ship was captured by the Portuguese, and was eventually wrecked in a storm while at anchor under Portuguese control. The Victoria set sail via the Indian Ocean route home on December 21, 1521. By May 6, 1522, the Victoria, commanded by Juan Sebastián Elcano, rounded the Cape of Good Hope, with only rice for rations. Twenty crewmen died of starvation before Elcano put in to the Cape Verde Islands, a Portuguese holding, where he abandoned 13 more crewmen on July 9, in fear of losing his cargo of 26 tons of spices (cloves and cinnamon). On September 6, 1522, Juan Sebastián Elcano and the remaining crew of Magellan's voyage and the last ship of the fleet, Victoria, arrived in Spain, almost exactly three years after leaving. The expedition actually eked out a small profit, but the crew was not paid their full wages. 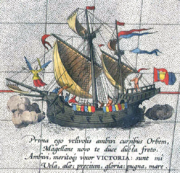 Maximilianus Transylvanus interviewed the surviving members of the expedition when they presented themselves to the Spanish court at Valladolid in the fall of 1522, and wrote the first account of the voyage, which was published in 1523. The account written by Pigafetta did not appear until 1525, and was not wholly published until the late eighteenth century. Four crewmen of the original 55 on the Trinidad finally returned to Spain in 1525; 51 of them had died in war or from disease. Magellan's voyage was the first to circumnavigate the globe and the first to navigate the strait in South America connecting the Atlantic and Pacific oceans. Magellan's voyage proved conclusively that the earth was far larger than presumed by earlier navigators, and that the earth's surface was covered with a preponderance of water. Magellan's crew observed several animals that were entirely new to European science. These included the "camel without humps," which could have been the llama, guanaco, vicuña, or alpaca. A black "goose" which had to be skinned instead of plucked was the penguin. Two of the closest galaxies, the Magellanic Clouds, were discovered by crew members in the Southern Hemisphere. The full extent of the Earth was also realized). Following Magellan's voyage later navigators would explore the vast reaches of the Pacific Ocean, the Arctic and Antarctic regions, as well as search the Atlantic seaboard for the elusive Northwest Passage that would enable maritime trade to the Indies without the arduous detour through the Straits of Magellan. As a result of the Age of Discovery European maritime powers, notably Spain, Portugal, France, Great Britain, and the Netherlands would come to colonize newly discovered lands around the globe. Driven largely by the promise of wealth, colonial powers were often ruthless in relations with indigenous peoples, yet also spread Christianity, humanitarian values, and Western traditions of law and government throughout the world. Magellan's voyage inaugurated a new understanding of the world as the finite domicile of humanity and led to greater recognition of the world's peoples as a global human family. ↑ Tait M. Swenson, First Circumnavigation of the Globe by Magellan 1519-1522, The Web Chronology Project. thenagain.info. Retrieved March 18, 2007. ↑ John Szpytman, "Ferdinand Magellan" by Otto HartigCatholic Encyclopedia, 1910 ed. newadvent.org. Retrieved March 18, 2007. ↑ Eyewitness to History, The Death of Magellan. Retrieved March 18, 2007. ↑ Juan Sebastion Elcano, Edited Appletons Encyclopedia. Retrieved March 18, 2007. ↑ The Map House, Maps of the Magellan Straits and a brief history of Ferdinand Magellan. Retrieved March 18, 2007. All links retrieved April 5, 2017. Lists of crew members: 107 people. The 18 who returned on Victoria. A picture of the 1522 disembarkation with names of the 18 from Museo Naval. This page was last modified on 5 April 2017, at 16:23.